Dr. Criss visits pre-K classes to talk about microbes. She brought in Petri dishes for the students to test the microbial load on different surfaces, before and after wiping them down. They also examined the microbes that were on their bodies, shoes, etc. She grew up the microbes on the dishes and then brought them to the class to show them. They talked about where microbes are found, their different shapes and sizes, and how they can be both helpful and harmful. One student actually got to pick his nose for the petri dish experiment (!) said he now wants to be a scientist! Another student can’t stop asking about neutrophils, bacteria, and viruses! 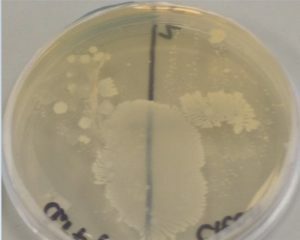 Below is a plate of grown bacteria. The bacteria were collected from the students and Dr. Criss brought them back for the students to see the grown bacteria.